amlak nfisachewn yimar, y abatoch dingetegna mot betam asgerami new, minm enkuwa rjim edime binorum zarem yasfalgun neber. yalegne mlikit binor adisu tiwlid teqararibo eyatwayaye bebetakiristiyan yalwin dirsha kabatoch eyatemara birada tiru new! abatachene yasfelegun nebere negere gene...amlake fekedo ena wedo new yewesedachew. 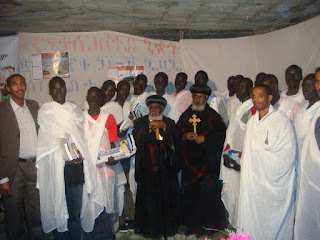 Kidus abatachinen Amlake Kidusan Yekebeleln, Ke kidusan Gare yidemerelen.Kezihe mekeraw kebeza betekristian enquane beselam teteru. fetari yeabatachenene nefse keabreham, keyishak, keyakob ategebe askemetelene. 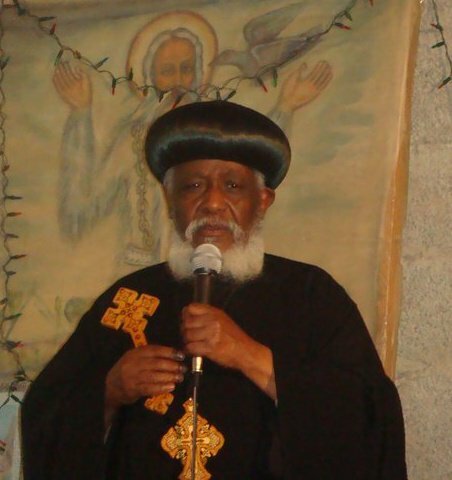 Known for being pro Abune Paulos and MK at the same time. It is amazing how he managed to reconcile his mind,spirit and soul.I am not sure if this is what expected of a bishop. I am realy sad because in one side our prominent fathers have been passing away and in other side we are fighting each other as the result of ignorance. Sorry! Wey agerie ! wey betekristianie! With all what has been said of him by MK, he will also BE rememberd for blocking the administrative reforms in EOC. MK and DS, be honest, he has harmed the mother church as much as he was pro MK. My condolences to his family and fiends. Well, a monk is conisdered dead when he gets ordained as such according to Metsehafe Menekosat. So, we should say that he departed the earth.. instead of died. If he served the church well with faith and integrity, he would be among the saints in heaven. Otherwise, the stories in the Ra'eye Mariam are very much terrifying. What a stressful day it is! !Fetenaw bebezabet weqit na qorati abatoch bemiyasfelgubet weqt bitu abatachnini matati betam yaschenqal.Kemarefachew befit debre mithmaq kidus philipos/kolfe/ beteqrstiyan 25yrs kibr kedsew neber, maksegholetam burake teqbye neber,menbere phipsna hagere sibketachew lay lemaserat gebi masgegha sira liseru tezegajtew neber,BUT EVERY THING BEING HISTROY AFTER ALL THIS STRONG FEELINGS.BITU ABATACHN BEATHEDE NEFS HONEW LEFETARIONA LEFETHARIACHN SLE KIDST BETEKRSTIYAN KEQDEMUTM KIN BITUAN ABATOCH GAR HONEW YITHELYULN YERSON DINGETEGHA METHERAT YEFETHARI SIRA BIHONM EGH LIJOCHWO GIN MINGZEM KEWSTACHN AYTEFAM.NEFSON KEQDUSAN GAR YIDEMRLIN MINGZEM ANRESAWOTM BURAKIWO NA TEGAWO YIDERBNI.YETEKERACHHUTM ABATOCH TEGTACHHU THELYU MIHLA AWJULN/. Abatochachinin min nekabin. keriwochun Esu MedihaniAlem Yitebikilin.